The painting is just signed “Challis”, but I am confident that this is by the Southend artist Eric Challis. 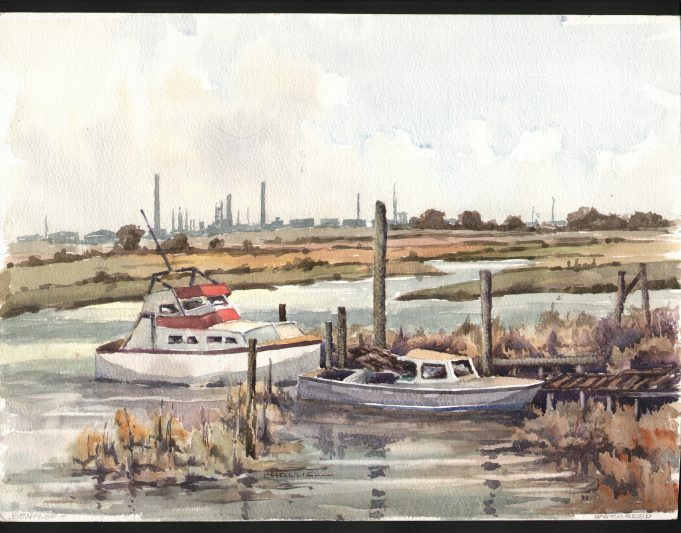 If you can add to our knowledge or have pictures of Benfleet by this artist, please get in touch. I worked with Eric on the Co-op late 70s. In April ’79 my father died but loved Old Leigh. As a xmas present for mum that year he painted me the cockle boats , she still has it. What happened to the paintings in Southend hospital corridor? How can I help you? I am Eric’s daughter – sadly he died three years ago. I also paint http://www.theodesign.net where you can find my contact details. I have two watercolour paintings from that artist.